On a Sunday evening in April, when the sky is getting darker, some people, old and young, Japanese and foreigners, gather at a big hall in Outemae high school. Hundreds of people (maybe more) are waiting for the show to start and feeling excited. Then, at 6:30 pm, the show finally begins. The spotlight finds two foreign women dressed like Hawaiians and the audience’s attention goes the women. Then the women start singing and dancing a Hawaiian-like dance introducing the show is about through the song. When their dance finished, the curtain gradually goes up and there, six foreign people dressed like a Japanese Bushi and they start their performance speaking Tosaben, the local Kochi dialect! 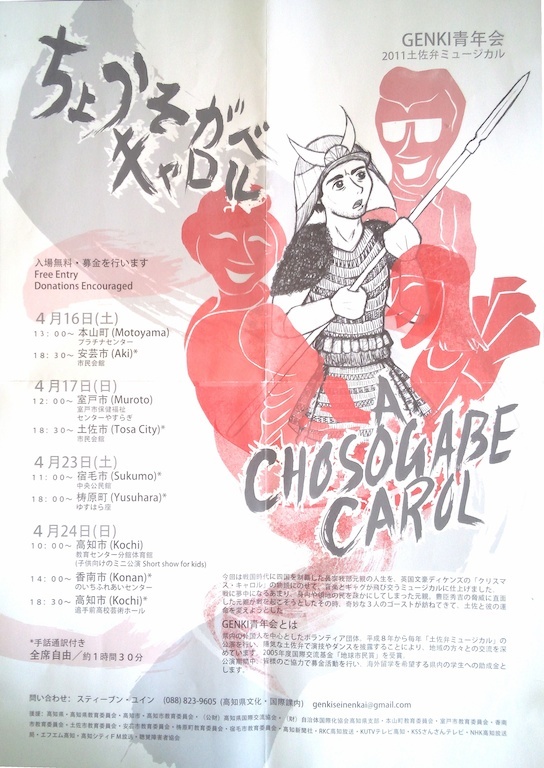 The show is “A Chosogabe Carol”, a musical about Chosogabe Motochika, Shikoku Conqueror, mixed in with Dickens’ “Christmas Carol,” was performed in the 2011 Tosaben Musical. The Tosaben musical is performed by Kochi JETs and all in Tosaben. The musical is performed on second and third Saturdays and Sundays of April. Every year, Kochi JETs make an original story combining historical things or people related in Kochi with famous story such as fairy tale. The entrance fee is free so you can feel free to enter but you will be asked for a donation to help students who want to go study abroad. The musical has started in 1996 as a first project of GENKI seinenkai. GENKI seinenkai is a group associated by Kochi JETs. Its aim is to give opportunities to Kochi locals to communicate and cooperate with foreign people and vice versa. This musical cannot be successful without Kochi locals’ supports. For example, performers practice their Tosaben using some textbooks. However, intonation is probably the most difficult thing to speak Tosaben and it’s quite hard to improve the intonation by books. Listening to real Tosaben intonation is quite important. Therefore, volunteer native Tosaben speaker’s help is necessary for the musical. Every year, the volunteers listen to the performers’ pronunciation and try to fix it to sound as fluent and natural as possible. Besides, the volunteers audio-record their voice of the line of the musical for the performers. To teach Tosaben to foreigners, the local volunteers have to think of peculiarities of Tosaben. That gives the local volunteers new surprises and makes them feel how wonderful Tosaben is. All these expressions mean that he did his homework in the past but indicate a slightly different situation. The first one, “やった”, is the simple past tense, showing simply he did his homework somewhere in the past. It is not sure whether or not he has finished his homework. The second one, “やりよった”, is the past continuous meaning “I was doing.” He was working on his homework but the focus is the action that he was working on his homework so it does not matter whether or not he has finished his homework. The third one, “やっちゅう” is the present perfect. The focus is that he has finished his homework rather than that he did. The last one, “やっちょった” is the past perfect. He had finished his homework somewhere in the past. The focus of this aspect is that his homework had been finished somewhere in the past and it probably have been finished until present and later on but there could be a possibility that he got some trouble after he finished his homework and he has to redo or something. Finally, Tosben is distinguished by the so called yotsugana (四つ仮名）. Yotsugana refers to the four Japanese letters which are “ず”, “づ”, “ぢ” and “じ”. In Hyojungo, ”ず” and “づ” are pronounced same as “zu” and “ぢ” and “じ” are pronounced same as “ji”. However, in Tosaben, they are pronounced differently such as that “ず” as “zu”, “づ” as “du”, “じ” as “zi” and “ぢ” as “di”. Actually, the distinction of Yotsugana used to be happening in every prefecture in Japan. In the Kamakura period, The distinction of Yotsugana still exists in every prefecture in Japan.The pronunciation of Yotsugana was “zi”(じ）, “di”(ぢ）,”zu”(ず）,”du”(づ）. However, in the middle of the Muromachi period , the affection of “ち”, “ぢ”, “つ”, “づ” occurred. Because of that, “ぢ”and “づ” pronunciations has become similar to “じ”and “ず” pronunciations. In the Edo period, “じ” and “ぢ” pronunciations has become the same and so as “ず” and “づ” pronunciations. Despite of the assimilation of Yotsugana, Tosaben has kept its way to distinguish Yotsugana. However, the distinction is now being lost. For example, almost no Kochi native youth can distinguish Yotsugana. That means the Yotsugana will not be distinguished in several years later in Kochi too and if the assimilation become more and more popular, that could endanger a dialect. In addition, the Tosaben that is spoken by middle and old aged Kochi people and the one spoken by young Kochi people are little different. For example, a Tosaben word “こじゃんと kojanto (very)” is one of the well-known Tosaben words for non-Kochi native people. You might hear that from middle or old aged Kochi people but you hardly hear that from young Kochi people. They say “めっちゃ mecha” instead. “めっちゃ” originally came from “関西弁 Kansaiben”. Tosaben is changing, taking in popular culture expressions from other dialects. If that trend continues, it could mean the eventual loss of Tosaben. A dialect is a language and a language holds its culture, tradition, customs and history. We must be proud of our dialect and we must protect it as we cannot just abandon our culture. Tosaben musical is playing that role greatly by foreigners. The musical finishes and the performers bow. Then the audiences give the performers a thunderous applause as the curtain goes down. And I thought it was a wonderful musical, not just because the music is so much fun and impressive. I thought of a wonderfulness that the musical was made and performed by foreign people. Tosaben that they were speaking is in the musical is the one spoken by old people so the musical might sound old to young Kochi people as I felt like that. Although that “old Tosaben” is still recognizable to Kochi people since they still many chances to hear that in daily life though they do not speak. However, when those young people become older and older, there would be less and less opportunities for Kochi next generations to hear the “old Tosaben” That could be the loss of Tosaben or merely, changing of Tosaben. In any case, Tosaben musical would be the greater opportunity to hear “old Tosaben” and that would help greatly to maintain Tosaben. Tosaben has been preserved by and with foreigners, that sounds great! I didn’t know that Otemae high school hold such a great musical. Since I came in Kochi, I’m surprised how strong and different dialect people speak. As you said, there are many ways of using Tosaben. I wonder how foreigner speak Tosaben in musical because even if I’m Japanese, sometimes confuse. It’s good opportunity between young people and old people. Through this invent, they can connect each other and keep their traditional. I’d like to see it next April! I didn’t know this interesting musical. I’m familiar with Tosaben and can speak in it fluently because Kochi is hometown of my mother and she often uses it. I really like Tosaben. So, I’d like to watch this musical! Thank you Kengo, I really enjoyed your story! I went to see 2012’s Tosaben musical and as you write I could find some characteristics of Tosaben which I do not care about so much in daily life. Unfortunately, I missed this year’S musical so I am really looking forward to next year! It’s very interesting article! I’m from Shizuoka and when I came here and heard Tosaben for the first time, I was so impressed. I still can’t speak Tosaben fluently, I want to learn it more and more by watching this musical!